There is now a new fork of ccMiner for Nvidia GPU miners available that adds support for X13 mining (this is not an official release). The fork of ccMiner by tsiv (source) adds X13 support with a performance that is just a bit lower than what Nvidia GPUs are offering in terms of X11 mining hashrate, though the hashrate could probably be further improved with some optimizations. 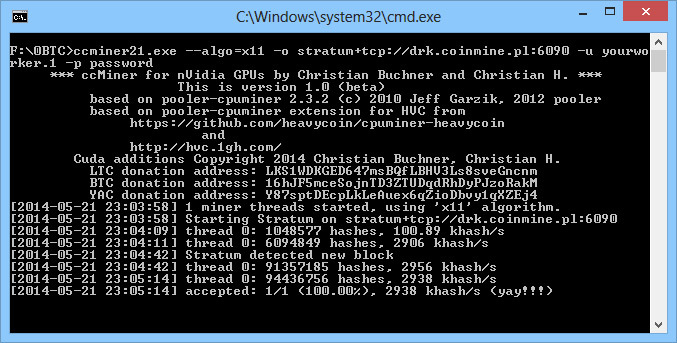 We have compiled a windows binary of the new ccMiner fork with X13 support that you can download from the link below and try it yourself or you can compile it from source yourself. Our tests are showing that with it we are getting a hashrate of about 1700 KHS on an Nvidia GeForce GTX 750 Ti video card and 3300 KHS on a GeForce GTX 780 Ti (non-overclocked cards). Do note that the windows binary you can download below is compiled for Compute 3.0, Compute 3.5 and Compute 5.0 cards (32-bit version only), so it will not work on older cards. 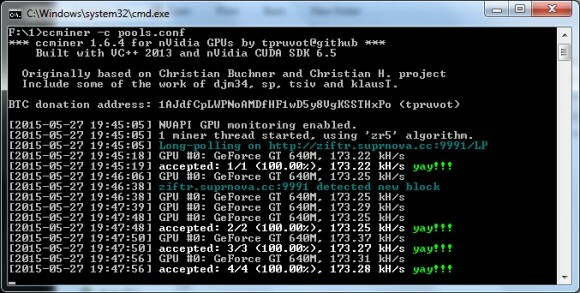 If you are unsure what version of Compute does your video card support check the included GPU Compute Capabilities List file. It is also compiled with Visual Studio 2012, so if you do not already have Visual C++ Redistributable for Visual Studio 2012 you will have to download and install it, otherwise you may be getting error for a missing DLL library.